Marco Polo's Plumbers were two unnamed plumbers who were employed by Marco Polo. They bear an uncanny resemblance to Mario and Luigi. 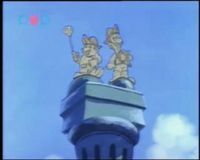 Marco Polo's Plumbers are referenced in The Adventures of Super Mario Bros. 3 episode "The Venice Menace". While Mario and Luigi are in Venice, Mario feels something reaching out to his soul, but he is unable to figure out what it is. At one point, they unknowingly pass by statues of the two plumbers that rested atop a tall column. Later on, after Mario and Luigi save Venice from Bowser, a gondolier shows them around the city and directs their attention towards the statues. He introduces the statues as Marco Polo's Plumbers, and explains that they brought plumbing back from China to help make Venice the city it is now. Princess Toadstool and Toad deduce that the plumbers are ancestors of Mario and Luigi, explaining why Mario previously felt so attached to Venice. This page was last edited on February 26, 2018, at 18:57.